Room thermostat calibration & accuracy guide: this article explains why a room thermostat may not be responding correctly to the actual room temperature. Factors that affect the room thermostat's behavior include is location in the building, for some models how level the thermostat was installed, the thermostat's heat anticipator adjustment, even dust and debris in or on the thermostat. Locate the room thermostat at about chest height on an interior wall, in a location where the thermostat won't be affected by drafts or other unusual temperature conditions. but where the thermostat will not be exposed to strong drafts from windows, doorways, or from a heating or cooling air supply register. As Carson Dunlop Associates' sketch (left) explains, there are a number of places where you should not locate the room thermostat. Do not place heat-emitting devices such as lamps or small appliances close to the thermostat. Their heat may affect its operation. Even when your room thermostat is properl-located and even when a warm-air heating system is operating normally, some rooms or areas within some rooms may be uncomfortable as heat may be distributed unevenly. Air stratification during the heating season can leave warm air collected near the ceiling with air nearer the floor uncomfortably cool. Solving this problem by turning up the thermostat or moving it lower on the wall can "work" but is likely to increase heating costs unnecessarily. Does the Room Thermostat Need to be Level on the Wall? It's important to mount mercury-bulb thermostats as level as possible since otherwise you're putting the thermostat out of accurate temperature calibration. That's because the coiled bimetallic spring has to move that mercury bulb to a tipped position to turn the heating or air conditioning system on or off in response to room temperature. When we found a thermostat that did not heat a room accurately to the called-for temperature, we'd take a look to see if it was installed out of level before looking further. Because the "set" range on these thermostats may have had a lower-end of 55 deg .F., when we wanted the thermostat to maintain a building at a temperature lower than the minimum that the thermostat dial provided, we just tilted the whole thermostat backing plate on the wall in the proper direction to shift the operating range of the switch. Newer thermostats that rely on other sensor and switch designs do not have this sensitivity to being out of level and some (such as the 3M-22 thermostat) note in their installation instructions that the thermostat does not have to be level. 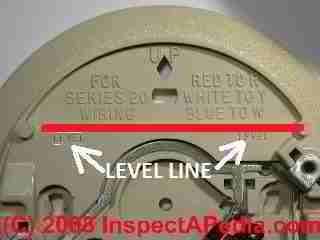 Our photo illustrates the red (R) and white (W) wire connections in a simple two wire heating control thermostat hookup using the Honeywell RTH2300/RTH221 series programmable wall thermostat. If your building uses steam heat see STEAM HEATING SYSTEMS. This article is part of THERMOSTATS our article series Guide to Finding, Using, and Adjusting Thermostats for Heating & Air Conditioning Furnaces & Boilers, Heat Pumps or Electric Furnaces or Boilers. A friend's a/c unit has the blower fan that will only work in auto, it will not work on manual. On the other hand, even when you turn the unit from cool to off, the blower still remains on. The only way the blower will turn off, is to turn the fan to manual. The wiring to the unit depends on if you have a heat pump, or straight a/c unit. It also depends on how the installer has wired the thermostat. With the heat pump, the red is power, the yellow is for cooling, the white is for heat, the green is for the fan, the orange is for the reversing valve, and the blue is usually always common. 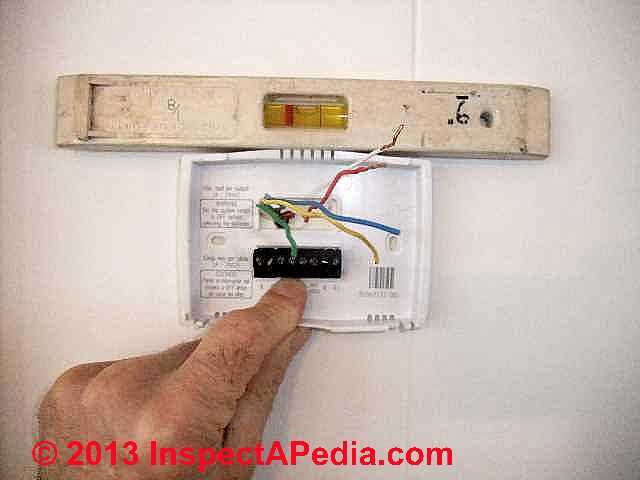 Again, you will have to check to see how the installer has ran the wires from the thermostat. If you have a a/c only unit outside, you will only have a red wire, and a white wire coming form the inside unit, to the outside unit. These will go on the contactor to send 24 volts to the coil to pull the contactor in. 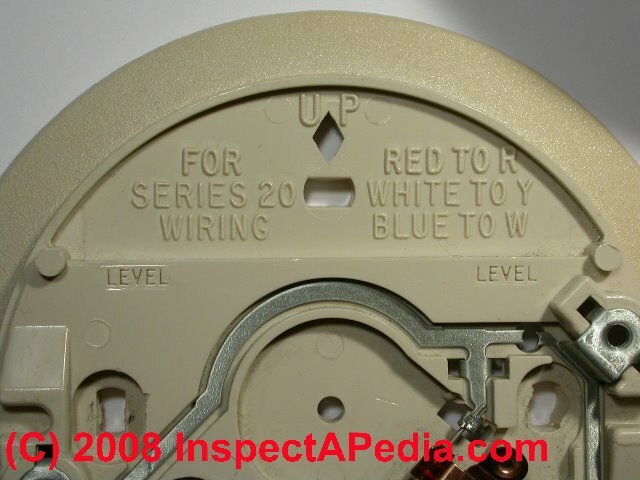 Also see THERMOSTAT WIRE CONNECTIONS where we provide lists and tables of color codes and wire connections for thermostats in various uses. most modern wall thermostats do not provide an adjustment that will calibrate the TT to the actual room temperature (and most of them are quite accurate). OLDER round Honeywell and other TTs that use a mercury bulb sensor can be tipped slightly on the wall - changing the TT out of level will change its calibration, since on those models a blob of mercury in a moving bulb rolls to connect or disconnect the two TT wires. Question: how do I fix a thermostat that I have to set lower than the level of heat I want? My traditional honeywell simple dial-type thermostat on the wall has two pointers and two temp. scales. However I have to set it on 60 degrees to get heat temp to 70 degrees. On most two-scale room thermostats, one scale reads the current or actual room temperature while the other scale is the set temperature - and is adjustable. When you move or adjust the thermostat to call for a different room temperature you will see the scale pointer move to your new setting on the "set" scale. Remember that a thermostat is just an "on-off" switch that turns heating or cooling ON or OFF in response to the actual room temperature and the desired or "set" temperature you've specified. Make sure that your thermostat is properly set - to "Heat" mode with the fan switch set to "Auto". and are not reliably signaling the heating system primary controller. I wouldn't normally place this guess first, but as you think the problem began after someone worked on the system it's worth a check. Look for a loose connection or intermittent short in wiring. For example if two thermostat wires short together that's the same as constantly calling for heat. The thermostat is being blocked from properly sensing room heat. That could be due to movement of the warm air supply registers to a new, more distant location, or more often, due to furniture, drapes, or even dust and crud that block the air inlet openings around the thermostat that allow it to sense room temperature. Dust can also interfere with moving parts in older spring-type thermostats. See TEMPERATURE RESPONSE of ROOM THERMOSTATS for details. The thermostat is tilted out of level. If the thermostat is an older mercury-bulb type then it needs to be level on the wall. or where cold air blows on it; if your thermostat was not moved and is on an interior wall and in a draft of cold air, this isn't likely to be the cause of the problem you describe. on occasion we find that the primary control on a heating system, for example an internal relay, is sticking and keeps heat on even after the thermostat has said "enough". This is easy to check. When the heat is on and running and the thermostat is set to say 68F, when the room reaches 68F (measured at the thermostat on its scale), just disconnect the thermostat wires right there at the thermostat. If heat keeps running (more than a couple of minutes if you have warm air heat), something else is wrong. Primary heater controls are discussed in different InspectApedia articles depending on what type of heat you have. There is some other problem we haven't thought-of. Keep us posted, what you learn will help other readers. You might, but first check the thermostat's room temperature reading (not its SET temperature reading) against the actual room temperature - use a room thermometer; Then be sure the thermostat is set to HEAT mode and make sure that the SET temperature is above room temperature. Then heat should run until the sensed temperature at the thermostat turns it back off; See the next Q&A for more details. Our heating and air unit is roughly 8 or 9 years old. When we first moved here (6 years ago) we kept the air set on 73-74 during the summer months. We were comfortable. First, are we looking at the same outdoor temperatures as previously? If not, if it's colder now than previously, the problem could be with your home's rate of heat loss - bad insulation, leaky windows &c.
If weather conditions are the same, then we have some other questions to ask: you don't say if your heat is from hot water or forced warm air. In either of those systems, even if the equipment is running as before, you could have a simple maintenance problem like a clogged air filter or air bound radiator that's the problem. I'd need to know more. Continue reading at TEMPERATURE RESPONSE of ROOM THERMOSTATS or select a topic from closely-related articles below, or see our complete INDEX to RELATED ARTICLES below. THERMOSTAT CALIBRATION at InspectApedia.com - online encyclopedia of building & environmental inspection, testing, diagnosis, repair, & problem prevention advice. Azel Technologies Inc., P.O. Box 53138 10 Royal Orchard Blvd. Thornhill, Ontario, Canada L3T 7R9 Ph: 905-223-5567 Fax: 905-223-3778 Email: info@azeltec.com, Website: www.azeltec.com. All Proliphix Network Thermostats come with our free Uniphy Remote Management Service. This unique offering lets you monitor and control your HVAC systems by simply pointing your Browser to our secure Proliphix Web Site. Enjoy the convenience of programming a thermostat from any location, using a simple graphical interface. No computer equipment or software is required. And since Proliphix takes care of the network configuration for you, you’ll be up and running in no time. We’ll even proactively monitor your thermostats and send you an immediate email or SMS message when an HVAC problem is detected.